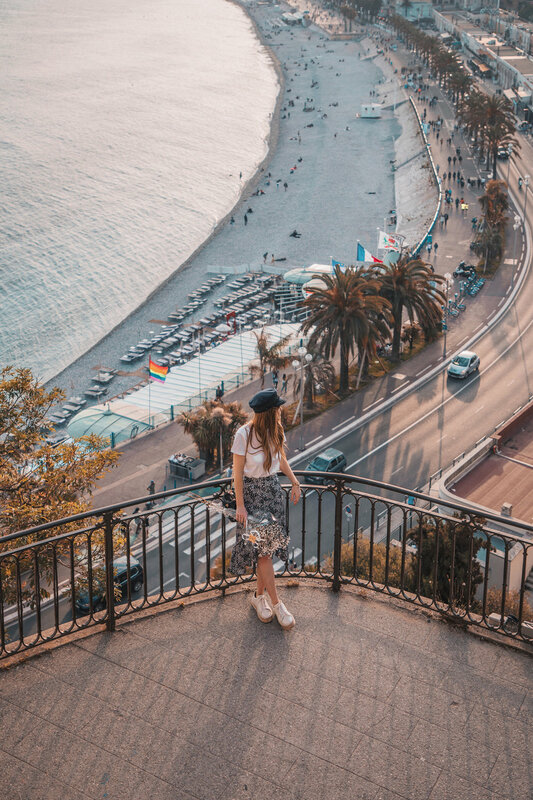 It had been a very warm spring day in Nice as we explored the many passageways of Old Town and treated ourselves with a little retail therapy. 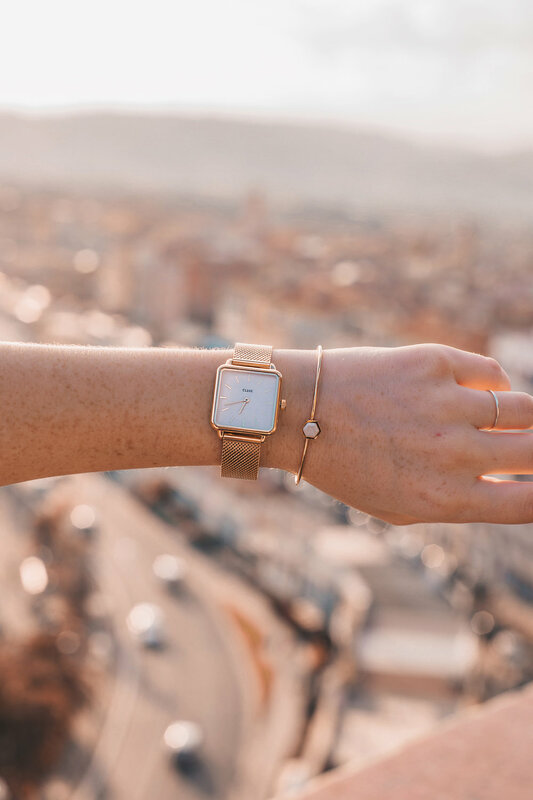 Instead of succumbing to our wary feet and the lure of our apartment’s picture perfect balcony view, we freshened up and ventured out to enjoy the sunset in yet another beautiful part of the world. Like so many before us, we found the prettiest spot to watch the sun paint the sky up the many stairs of the Castle Hill Lookout. 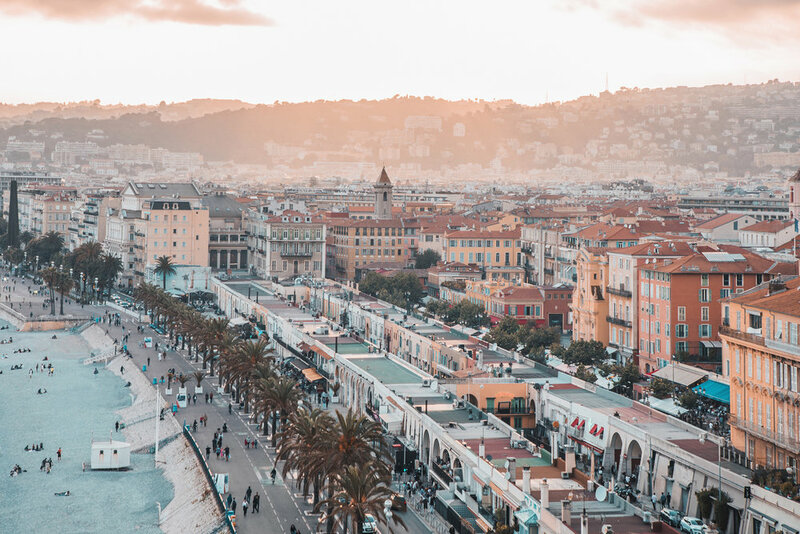 When we finally reached the top with shorter breaths, we were rewarded with majestic sweeping views of the colourful city, the bustling Promenade des Anglais and sparkling Mediterranean Sea. It was truly spectacular. Dressed in the printed midi skirt I’d fallen in-love with on our aforementioned shopping trip, my go-to white espadrille sneakers and much-loved CLUSE La Garçonne watch, we admired the spectacular sunset and paid homage to its heavenliness the best way we know how; by taking loads of photos, of course! With seagulls over head (seriously though, they’re the biggest seagulls we’ve ever seen! ), a fresh bunch of baby’s breath by my side (they have the most fabulous bunches of flowers in France) and my love in my arms (I’m talkin’ ‘bout you, Brad), it was an evening worth remembering. Before we knew it, the sun had fallen behind the hills and we were being ushered down the steps towards the Promenade (Castle Hill closes at nightfall). Isn’t it crazy how time flies so quickly when you’re simply in the moment? I honestly thought it was around 6:00PM and almost had a heart attack when I looked at my classic CLUSE watch to see it was past 8:30PM! Oh, Daylight Saving, you got me again. CLUSE La Garçonne watch (also love this round face style! ), marble and gold bangle and layered gold necklaces (here, here and here), UNIQLO white tee, H&M midi skirt, Lack of Colour cap, Zara straw bag and Rag & Bone sneakers.